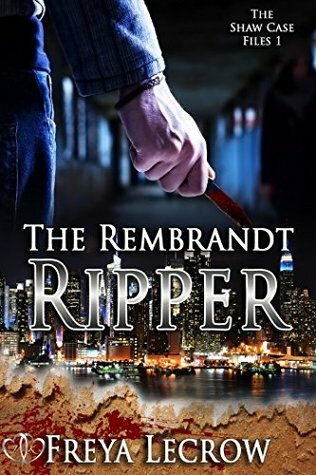 THE REMBRANDT RIPPER IS A STORY LIKE NONE OTHER BY FREYA LECROW A MUST READ!! I received an ARC of this book from the author in exchange for an honest opinion. This is Mismousey’s very honest opinion of ” THE REMBRANDT RIPPER”. I was honored to have been asked to read an review this murder mystery . The author is very new to me. As this is the very first time which I have read any of her writing. I am looking forward to reading more of her books. Ms. Lecrow’s writing style is similar to that of Stephen King and James Patterson together. They each write amazing and so does she. The way in which she is able to describe the crime scene in detail-and the victim. How they are laid out in such a away that is not imaginable. Yet, she has been able to it- and you the reader are able to picture it right before your eyes. The story is one of mystery and suspense. It has you on the edge of your seat. As you open the book, and start reading. You are held captive and are compelled to finish the book not putting it down till it finished. You are mesmerized with her storytelling and the characters she has placed before you. The plot of the story- cover- characters & scenes are all amazing. Ms. Lecrow has done an excellent job with each of these. Kissney is a police detective with the NYPD- has just lost her father and is still grieving. Rather than sit home she wants to get back to work. And back to work she goes. Her and her partner-Levi. Kissney has 2 men that are in love with her. Her boyfriend Kane (who is in the service) and her partner on the force Levi. Now Kane’s unit is leaving is overseas and he tells her that while he is gone to live her life. They aren’t sure if he will come back or not. During the this time- Kissney and Levi get close. They move in together. Start a relationship- Levi tells her that he loves her. Now you also have to realize that while they are working on there relationship with each. We have this horrible murder our there in the public. He is leaving dead bodies (females) -hookers in secluded areas. The Ripper leaves these women in a pose – he thinks they look like a lovely picture. The police think he well he has butchered them. The 2 detectives have not been able to find anything to trace it to the killer. It has now been 2 years- they are taken off the case. The killer doesn’t like this -on no he doesn’t. He decides to get even with the department. He writes a letter to the paper and tells the police department that for every day that they are kept off the case. He will kill one more couple. And to prove his point- they are to go to the park they will find the first couple. The mayor and the chief of police put them back on the case. Now this story has so many twist and turns- So much happens – You never know what to expect next. It keeps you on your toes!! What happens between Levi-Kane & Kissney?? Do they catch the Ripper? Who is the Ripper? I recommend this book for ADULTS ONLY over the AGE OF 18 . Due to the content of the book. Mismousey gives a rating of 50 out 5 stars. Make sure to add this one to your GOODREADS to read list. Then run and get your copy today. NOW WHAT ARE YOU WAITING FOR?? GO GET YOUR’S TODAY! Ms. Lecrow- this is an amazing an terrific story. When is the next one coming out?? I have to know what happens next.